Explore the ocean from a more intimate vantage point on a sit-on-top kayak. No experience is required to manoeuvre these very stable inflatable kayaks, allowing you to enjoy an unforgettable experience on the water, taking in breathtaking landscapes and wildlife. Whether it is your first time in a kayak or you just want time to be able to try other activity options during your voyage too, this shorter excursion is for you. Prices start from around £180 – £210 per person. Prices do vary depending on specific departure and ship; please contact our team of polar specialists for guidance. Cruise north in autumn to explore Greenland keeping watch for the aurora. Search for polar bears and whales along the ruggedly beautiful west coast. Follow in Franklin and Amundsen's footsteps exploring these legendary waters. Explore and discover these two unspoilt and remote wildernesses while hoping to catch a glimpse of the magical northern lights. Enjoy an in-depth exploration of some of Greenland’s most remote regions along the southern coast and through Disko Bay. 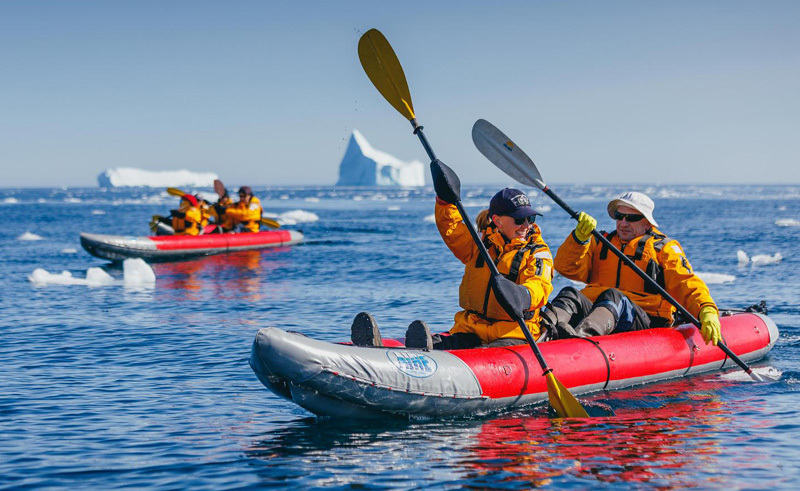 Superb wildlife, astonishing icebergs and traditional Inuit culture are what make this voyage so exciting. Explore the four islands of Spitsbergen, Jan Mayen, Greenland and Iceland. This in-depth exploration of the Canadian Arctic offers the chance to see a wealth of wildlife.